For those that have purchased this handgun, you may be asking yourself, “What is the best holster for Beretta 92A1?” Finding a holster that fits your needs is just as important as finding a handgun that works for you. Hands down, the Beretta 92A1 is a great pistol. It is rated at a 30,000 round lifespan so you will have years of enjoyment, on the range. You undoubtedly want a holster that is just as good. After doing the research, I have found the Blackhawk SERPA Concealment Holster to be one of the best Beretta 92A1 holsters. 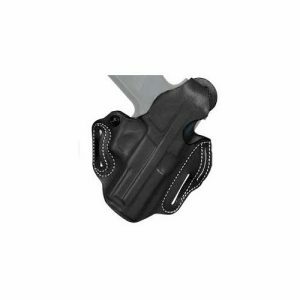 This holster is the perfect level two retention holster. It won’t slow you down, since quick draw and easy re-holster were integral parts of the design. Made of CQC carbon, it is durable, dependable and built to last. 2 Concealed Carrying a Big Handgun? Deciding which holster to purchase is a personal choice. There are different things to think about for different situations. You need to take things like how you carry, comfort, durability and budget into consideration. You want your handgun secure. This is why buying the first, inexpensive, holster, that you come across, online is not necessarily the wisest choice. You do not want any chance of your firearm slipping out of the holster nor do you want to chance accidental discharge. Even having the holster getting in your way during daily activities can be a disadvantage. First of all, you want the gun to remain in your possession at all times. Having the gun loose and adding the risk of it falling out or being taken away from you is not an option. Yet, you don’t want your pistol held so tightly in it’s holster that you can’t get the thing out without ripping your belt off. A good quality holster will take both of these things into consideration. 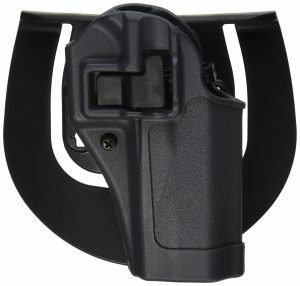 Most high quality holsters, especially the plastic ones, come with adjustable retention screws. The holster should be molded to your gun make and model, to ensure a good fit. The retention screws are for you to customize the level of retention and find that perfect balance of security and ease of draw. You want to look for a holster that has a trigger guard that completely covers the trigger. You just don’t want to risk accidental discharge because you hit the trigger while trying to draw the gun. A number of odd stories are out there about accidental discharge. Play it safe, cover the trigger. A quality holster will keep your firearm in the correct position to draw from. Since the art of quick draw is basically muscle memory from practicing, you don’t want to be caught in a real life situation fumbling around trying to find your gun. A quality gun belt plays a role in the stability of everyday carry. You will want a strong, high quality gun belt to aid in the stability and safety of your firearm. Concealed Carrying a Big Handgun? A lot of people who conceal their weapon as they carry, have smaller handguns. Compact, or micro pistols are easy to carry. They are compact, easily hidden and lightweight. It seems like they are perfect for concealed carry. Larger guns have advantages too. You can get a good grip on the handle, aiming is easier with the longer sight radius, recoil is less with the added weight and size. Add that all up and larger guns are easier to shoot. The only drawback in a larger gun is that it is harder to conceal. You can conceal them, it just takes a little more effort. They have a little more weight and a little more bulk that needs to be hidden. Hybrid IWB holsters are a good solution for larger size pistols. The large back panel will help distribute the weight of the gun and help it stay in place better. The result is a lighter feeling gun that stays close to your body.The kydex mold locks your larger pistol into place and angles it forward so there is less printing from the larger size. 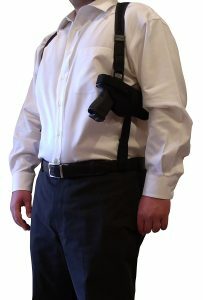 A good shoulder holster can be a good solution, especially if you spend a lot of time sitting, where IWB would not work. You can carry the firearm on one side while adding extra magazines to the other side creates a nice balance. Wardrobe needs to be considered with shoulder holsters. You will need a jacket to conceal. You also want to practice your draw stroke so that you point the gun towards the ground rather than people around you, as you get your gun on the target. You can hide your gun in plain sight. Off body options include purses, briefcases, fanny packs and backpacks. These are good options if you are engaging in some type of activity where you have the bag on you at all times, like bike riding or hiking outdoors. If you are in a situation where you put the bag down often this may not be the best solution as you need to be responsible for your weapon at all times. Your choice of a holster deserves as much thought and research as you put into choosing a firearm. There are many different holsters to choose from. Let’s get back to the top picks and see if we can find you a holster that may be just the one you want. The top holster for the Beretta 92A1 is the Blackhawk SERPA Concealment Holster. The patented SERPA auto lock release keeps your firearm secure. It is automatically positioned to facilitate the correct drawing motion and is one of the features that makes this holster a great level two holster for concealed carry. This holster has a trigger guard, and the SERPA locking mechanism. It boasts a full firing grip for quick, easy draw and reholstering. This is a good choice in shoulder holsters for those days you need to carry this way. It comes reversible so it works for both right or left hand draw and is fully adjustable to fits large or medium frame guns. 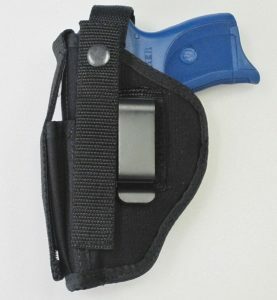 This holster is a simple hip holster that is rugged and stable. The multi layer nylon forms to the shape of the gun. There are many holsters to choose from. After much consideration I chose the Blackhawk SERPA Concealment Holster. I really like the extra security and that it holds the gun very well. Holding the gun in place, securely, is the most important job of a holster. This holster performs well in a variety of carry situations. It is an all around excellent holster for the Beretta 92A1 and I recommend giving it a try.